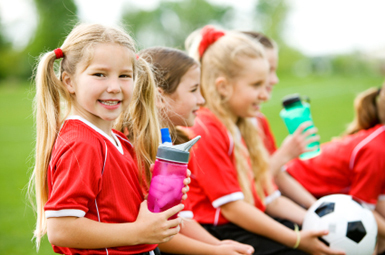 When looking for safe water bottles, check to see that they are BPA-free. Most of us use water bottles is a couple of ways. We buy bottled water for one time-use, and we buy more sturdy water bottles for long-term use. When buying bottled water, check the base of the bottle for the recycling number. It is usually number one. And that’s OK. But it is OK for one use only. These bottles are not designed for repeated use. Use once, and then recycle. The issue of safe water bottles becomes more important when buying bottles you are going to use again and again. Many of these bottles are made from number seven plastic. In other words, they are made from polycarbonate. They are made this way because polycarbonate plastic is extremely strong. It is rigid and almost unbreakable, even if you drop your bottle on a hard surface. The trouble is, polycarbonate plastic contains bisphenol-A, also known as BPA. While there are controls in place to limit the use of polycarbonate plastics in the European Union and elsewhere, there are no real safeguards in the U.S. In the U.S. you depend on your own vigilance and the voluntary actions of manufacturers. For example, Nalgene makes a popular line of sports water bottles that contain BPA, but has voluntarily starting phasing those out and now offers BPA-free water bottles. If you are buying a water bottle, just be sure that there isn’t a number 7 in the recycling icon on the base. There are also alternatives to plastic water bottles. In response to concerns about BPA, several manufacturers are now making water bottles out of light weight stainless steel. These are BPA-free and designed to last indefinitely.